Here’s another one for the boss man himself, Mauz from Kicker / Dystopia. He got this amp years ago and it was his go to for a long time. 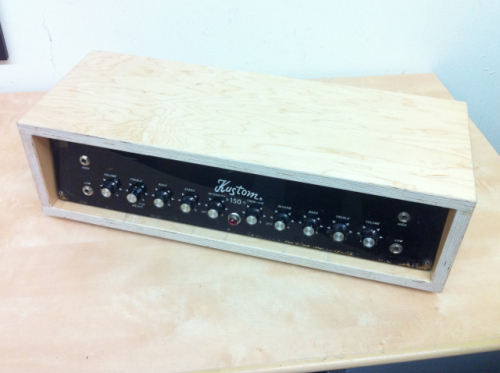 The Kustom 150 was sold as combo amp, but this one had been freed from its moorings and placed into what amounted to a cardboard box. Mauz had a new box built for it by our shop neighbor Chris. It looked nice now, but little did Mauz realize, this amp COULD KILL HIM. This oldie-but-a-goodie was wired with a two-prong plug, as was the standard for all electronics before people stopped being idiots. That’s fine for a toaster. But when you have a guitar in your hands, you become part of the circuit. Without a connection to to actual earth, a.k.a. common ground, any AC electricity accidentally loosed onto the amp’s chassis will only find you. Zap. 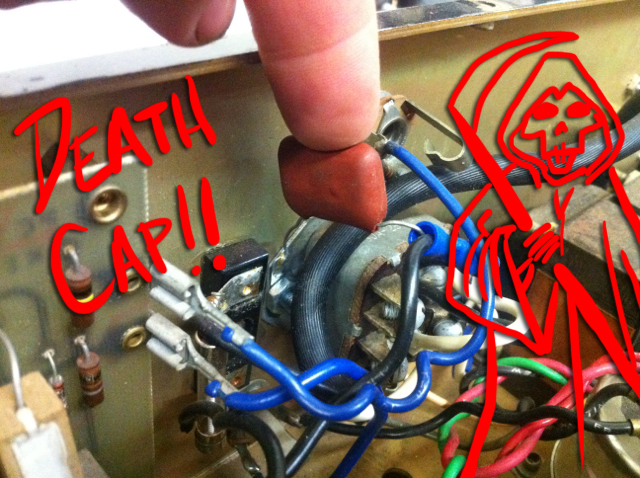 It was time to update the safety of this amp so I would still have a boss who is alive. 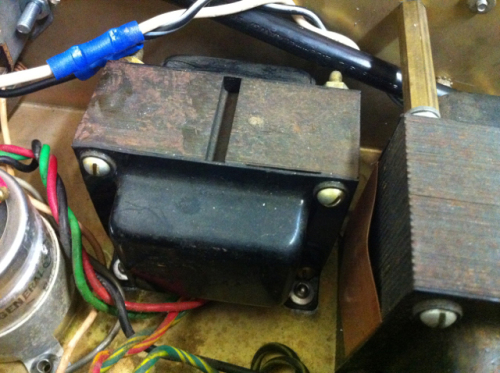 The problem with the original set up is the way two-prong AC connects to the floating ground (the chassis) of an amp. A capacitor, fittingly referred to as a “death cap,” connects either of the two AC leads to the chassis. This is used to filter out high frequency noise in the line. 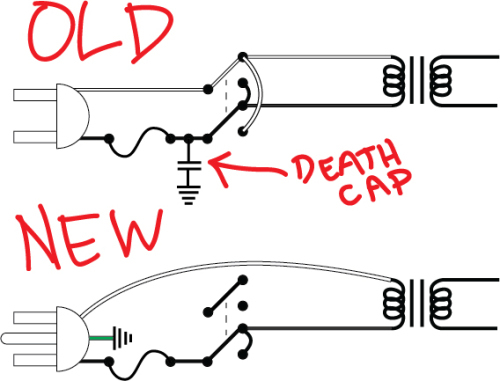 When this cap fails, as will happen inevitably with age, it will send 110V through the chassis, to the ground of the instrument, into the guitar strings, and maybe into your heart. It’s not looking for love, it’s looking to kill you. the river Styx has a harsh “current.” GET IT?!?! The surgery is simple enough in this very sparse solid-state amp. You can buy an open ended three-prong cord from Home Depot or any good hardware store. The three wires coming out are black (hot), white (neutral), and green (ground), at least in good ol’ ‘Merica. Unsolder the old leads and remove the old plug. When you put in the new one, the black lead, the hot wire, should connect to the fuse. 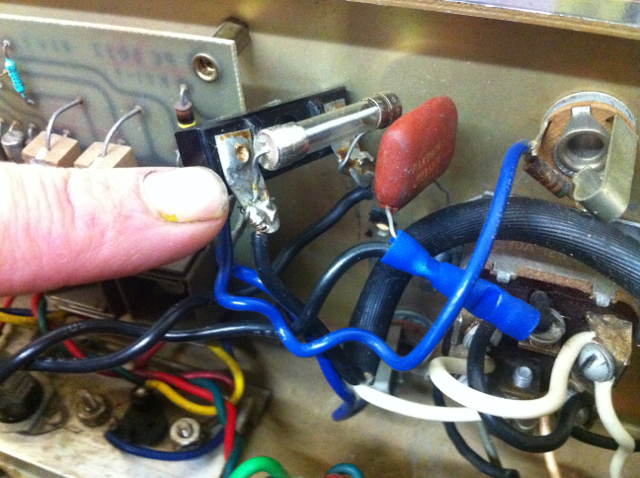 The fuse, if possible, should be removed and then the black wire soldered to the fuse-holder. It’s important the fuse is first in line for the hot lead in order to protect you from fire. 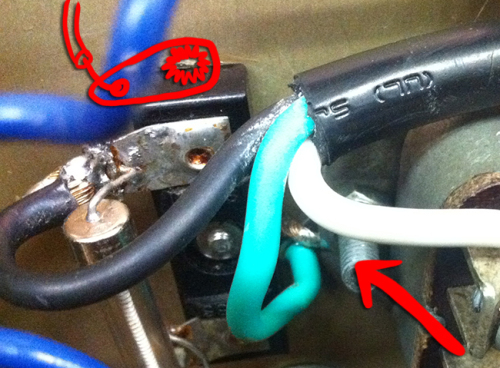 It’s not there to protect the amp’s circuitry. After the fuse, this path goes through the thermistor. What is a thermistor? Don’t even worry about it. Then the path goes to the power switch. This on-off-on DPDT switch was wired so you could change polarity to reduce potential line noise if an outlet was wired incorrectly. It’s unnecessary now that we’re attaching an actual lead to common ground. I used the same switch, but attached the black lead to both sides of the switch with the black primary wire from the the power transformer in the middle. I removed the white lead from the switch altogether. 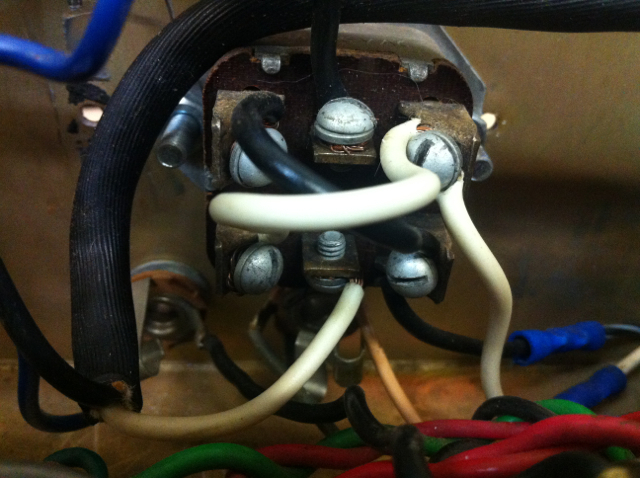 The white lead, the neutral line on the AC plug, connects directly to the white primary wire coming out of the power transformer. The green wire, the connection to common ground, is mounted on a bolt connected to the chassis using a solder tab with a lock washer. Some people suggest attaching this to a lug on the power transformer, but I just used the lug that the death cap was formerly attached to out of convenience. The power transformer was riveted in. Whatev. Just make sure the green wire is the longest. Despite having a cord strain relief, we want the common ground to disconnect last if the cord gets yanked out. Like if your dumb roadie pushes over your rig. You will be alive and able to beat up your roadie. With that solved, I had another problem to tackle. This Kustom 150 would intermittently vibrate and a horrid buzz was audible through the speaker. It turned out it was the output transformer. The rivets that fastened it to the chassis had come loose and it was vibrating at 60 Hz (60 cycles per second, the rate at which AC is transmitted). I discovered this by turning the amp on and physically holding the output transformer steady onto the chassis. Do not do this. This is dumb. I re-rivetted it to the chassis and the amp was back up to speed. The Kustom 150 had its license to kill revoked and it can now, safely, kick out the jams.